Steven Gerrard: "I felt my studs sink into his flesh." Ex-Liverpool captain Steven Gerrard says he was 'taught to loathe Manchester United' and recalled his rage that led to the stamp on midfielder Ander Herrera in March. The 35-year-old, who in May brought an end to a 17-year career at the Anfield club, had the details revealed in the serialisation of his autobiography. 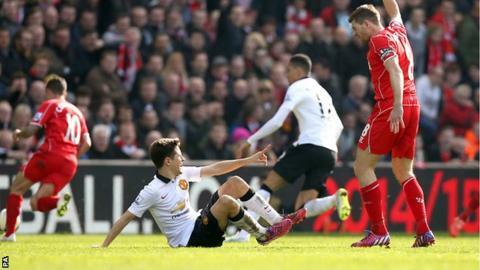 Gerrard was sent off after 38 seconds during the 2-1 loss against United. He said: "It was 38 seconds defined by anger, a kind of madness." "I couldn't stop myself. Without even giving myself time to think I brought my left foot stamping down on Herrera. I felt my studs sink into his flesh just above the ankle. It had to have hurt him." On the subject of Liverpool's rivals, he added: "I had been taught to loathe Manchester United." Gerrard had entered the field as a half-time substitute at Anfield, but was soon back down the tunnel. "It had taken me just 38 seconds to get myself sent off against Manchester United," he added. Thirty-eight seconds in which I had been at the heart of every small cameo of action and ferocious display of rage." Meanwhile, the LA Galaxy midfielder suggested that he was "misled" by Reds manager Brendan Rodgers, prior to the Premier League match against United. The former England skipper was adamant that a text message sent by Rodgers indicated he would start the game, before being told in person he would not be. "It hurt me, especially because of our previous conversations and the fact that his Wednesday night text, which had been full of praise, had misled me," he said. "I'm sure he didn't mean to give me the wrong impression but his text confirmed in my mind that I would be selected." Liverpool play rivals United for the first time this season, on Saturday. The match kicks off at Old Trafford at 17:30 BST.